As the Holidays are traditionally celebrated with white meats, ham or fish it’s best to set aside Cab and Shiraz and open lighter reds such as Pinot Noir. Other favourable features of Pinot are a slight sweetness, compatibility with a broad range of foods – and most importantly, its natural charm. If Pinot has not been on your Holiday table before you’re not alone. This is my first time recommending it because up till this year it was barely available and certainly not very affordable. I’ll be surprised, (and disappointed), if we don’t see even more availability in 2012. I’ve arranged my picks into three categories so you know what to expect. Of course you’ll have the most fun if you explore all three styles. LIGHT, BRIGHT: These are best suited to early evening sipping, and food, and would be my choice with the big meal. Lightly chill. Bichot’s wine is the best, everyday priced Burgundy red I’ve ever tasted. Could convert a lot of people to light reds. I love the earthy, funky character in Pelee’s wine. Lots of character. Rosewood is light, lively and delicious. SLIGHTLY SWEET, BIG TIME CHARMERS: All of these have picked up vanilla and other spicy notes from time in barrel. They pair well with mildly ‘hot’ foods. And company. Very seductive drinks for Winter parties. 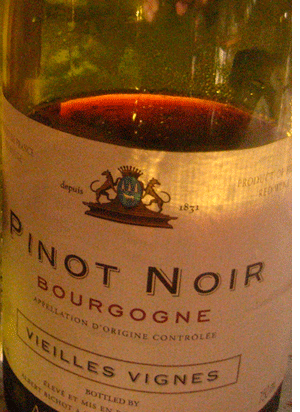 DRY AND UPSCALE: Burgundy is the home of Pinot and these wines are crafted in the dry, French style. A veneer of New World friendliness/richness adds a yummy note to the experience. Delicious, up-scale reds for the big bird, or any time of the year. P.S Pinot is also a great with chocolate. Try medium dark with one of the middle category wines. Next articleLast Call for the Beach!